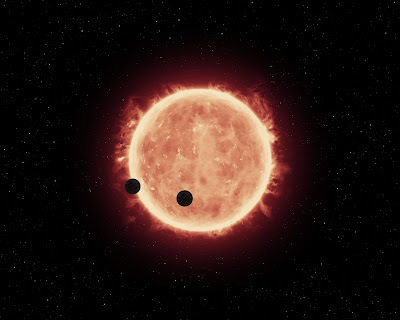 Stellar Planet: Double transit all the way across the star! Double transit all the way across the star! Artist impression of the TRAPPIST-1b and -1c transit. On May the 4th the Hubble Space Telescope (HST) trained its mirror on a little ultra-cool dwarf star, just 39-light years away, called TRAPPIST-1. What it saw was a rare, and before unseen event, two Earth-sized exoplanets passing in front of the star just minutes apart. These two planets, TRAPPIST-1b and TRAPPIST-1c, were discovered by a Belgian robotic telescope at ESO's La Silla Observatory in Chile. The TRAnsiting Planets and PlanetesImals Small Telescope (TRAPPIST) telescope has only just begun it's search of the 1,000 nearest dwarf stars and came up with a winner. There are a lot of papers and press articles you can read on this which I will link at the bottom, but here I wanted to tell my story of involvement and why I think this is a great step forward in exoplanet science. One thing to note is that TRAPPIST-1, the star, is just 2,500K that is cooler than some exoplanets that have been discovered. This means that even though it's planets b and c are very close with orbits of just 1.5 and 2.4 days respectively, they are still relatively temperate with estimated temperatures of around 250 degrees - similar to the inner planet of our solar system. The first thing that needs to be worked out to take our understanding of the implications further is what is the atmosphere made up of? This is a key step towards understanding these worlds and the nature of their environments. "What I love most about these observations is the presence of both planets distinctly transiting the star just minutes apart. " On May the 4th a team led by Julien de Wit from Massachusetts Institute of Technology (MIT) used Hubble to observe the system to get an idea of this. A week earlier I was called while in the UK by Nikole Lewis, who was leading the team from Space Telescope Science Institute (STScI), who asked if I would be interested in analyzing some new data she was involved with from Hubble for small earth sized planets. I was not told much more about what I would be analyzing or the nature of the observations but loving HST analysis and trusting Nikole I agreed. The day I flew back to The States, I remember landing and reading my Twitter feed to see that there had been a Nature paper on the discovery of three Earth-sized planets around a dwarf star. I then immediately emailed Nikole to ask if these were the planets we would be analyzing with Hubble. A day before the observations were to be taken I was called and told I should come up to STScI, just and hour north of Washington DC in Baltimore, to work on the data with the team as they would be getting access to it early in the morning. So I headed up for the start of what turned out to be an intense week or so of back a forth analysis and paper writing. As the only outsider to the TRAPPIST team, called in specifically to apply my expertise on analyzing Hubble exoplanet data I spent some time playing catch up, but quickly realized what a fantastic opportunity this was and how special these planets may be. So I want to say a massive thank you to the TRAPPIST team and Nikole for inviting me in, and for being so welcoming since. What I love most about these observations is the presence of both planets distinctly transiting the star just minutes apart. 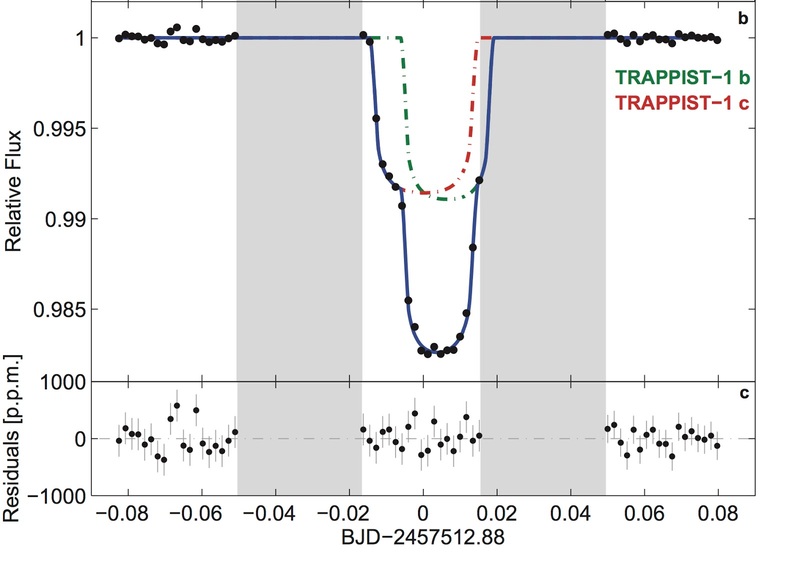 You can see that in the light curve in our paper. First TRAPPIST-1c (red), the outer planet, starts to transit, then just 12 minutes later TRAPPIST-1b (green) starts to transit. Due to the size/speed of their orbits they both then pass out of the disk of the star relative to us, the observer, at the same time. The blue model shows the effect of the combined light blocked out by both of the planets during the course of the observations. You can see in the video as part of the STScI press release an artist impression of this configuration. Fig 1 of the Nature paper - I have modified it by removing the top panel for the purpose of this blog post. See the paper for the full figure and caption. For these observations we used Wide Field Camera 3 (WFC3) on Hubble to observe this event in the near-infrared, just beyond the red part of what our eyes can detect. At these wavelengths you can detect the absorption from different things in the atmosphere by seeing how the amount of light blocked by the planets changes with small changes in the wavelength/color. 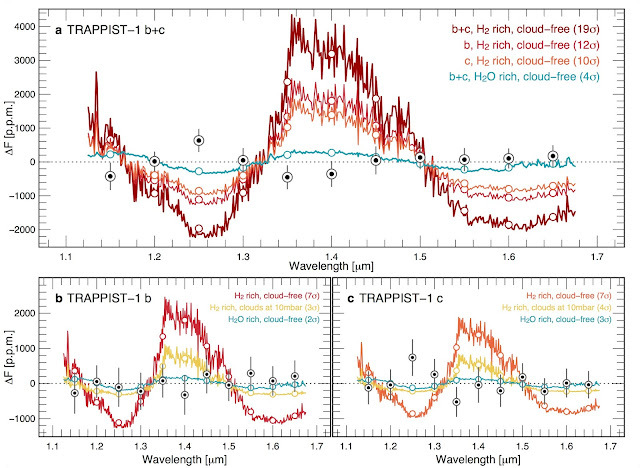 This method is called transmission spectroscopy and has been used to look at the atmospheres of many exoplanets (see my previous blog post on #HJSurvey). "I see great things for the future of exoplanet studies by looking at the TRAPPIST-1 system, and I look forward to seeing or even working on more results from the team." The observations we took of both TRAPPIST-1b and -1c showed us that these small Earth-sized worlds do not have large envelopes of hydrogen and helium. This is great! The lack of a puffy atmosphere like that of the gas giants in our solar system further hints at the rocky, terrestrial nature of these worlds. What you can see here is the measurements we made across the different wavelengths (black points), compared to different model atmospheres. Due to the combined signal of the two planets we were able to get very precise measurements, considering they are such small worlds around a small star. This is the first step towards future measurements of both planets as they transit the star apart over the next few years to rule out and confirm different atmospheric compositions. 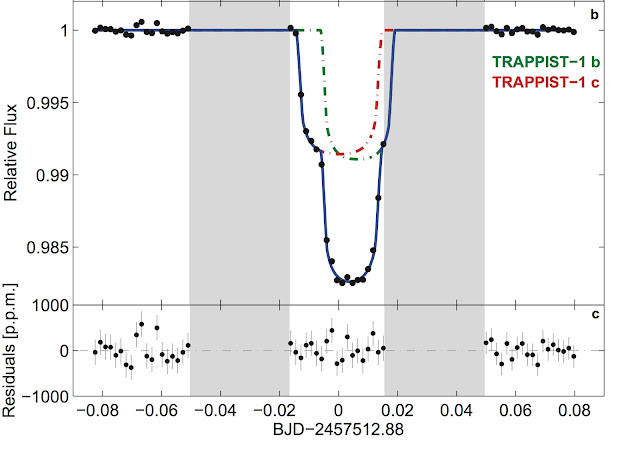 Fig 3 of the Nature paper - This shows the transmission spectra of TRAPPIST-1b and TRAPPIST-1c compared to different atmospheric models. The top is the combined transit measurements, the bottom shows the measurements made by deconstructing the light curve into the two planet components. With more Hubble observations we could potentially detect water in the atmosphere and get an idea of the depth of the atmosphere, or we could even get an idea if the planet has methane in its atmosphere. These types of preliminary observations are vital in the lead up to the launch of the James Webb Space Telescope (JWST) in 2018, which will be the next great observatory in space. JWST will get us even more information across more wavelengths where perhaps even biosignatures like CO and Ozone can be detected. We will also attempt to get more precise information on the planets temperatures and even possible the surface pressure. Another important aspect of these observations is the star itself. We actually know very little about M-stars. The classification of TRAPPIST-1 is M8 which means it is a very small very cold star. In fact it is so cold (in relative terms) it has a significant amount of water vapor that can exist in the stars atmosphere. One of the things we had to do for these observations was enlist the expertise of Jeff Valenti at STScI to help understand how the light from the star itself will change at different wavelengths so that it could be accounted for in each of our wavelength bins. There is still so little we know about the impact an M-star will have on the atmospheres or even habitability of their planets that this is another reason why looking at these systems is so fascinating. We need to study more M-star systems to get a better idea of their stars and understand how they change the planets that form and evolve. Small planets around small stars - where the relative amount of light being blocked out in transit then becomes large - are key steps towards our understanding of habitability, formation, and atmospheric dynamics. I see great things for the future of exoplanet studies by looking at the TRAPPIST-1 system and I look forward to seeing or even working on more results from the team. The NATURE paper can be found on arXiv or on the Nature website for those with a subscription.